Baxter Celsius Summer Ale makes debut next week | Beerpulse.com. 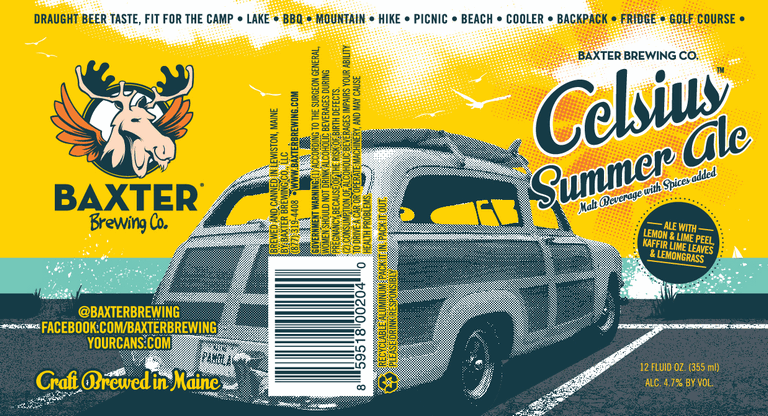 (Lewiston, ME) – Baxter Brewing Company, the acclaimed all-cans craft brewery in Lewiston, Maine, will release its first seasonal beer, Celsius Summer Ale, this week. “This may be the most refreshing beer I’ve ever tasted,” Livingston added. “Celsius is the first of what will be a continuing series of seasonal beers. We’ve been really gratified by the extraordinary reception for our first three varieties (Stowaway IPA, Amber Road amber ale, and Pamola Xtra Pale Ale), and we’re thrilled to be able to provide a seasonal selection from now on, too.” Celsius Summer Ale is already available on tap in the Baxter Brewing tasting room in the historic Bates Mill, 130 Mill Street, Lewiston, Maine. Tours are conducted at noon, 2:00 and 4:00, Thursdays through Sundays, or by appointment. More about Baxter Brewing: Located in the Civil War-era Bates Mill Complex in Lewiston, Maine, Baxter was the first brewery in the country to brew more than 5,000 barrels of beer in their first year of operation and was named the 2011 “New Brewery of the Year” by BevNet Magazine. They are also the first brewery in New England to package 100% of its beer solely in metal containers (aluminum cans and stainless steel kegs). The brewery also offsets 100% of its electrical usage every year with EPA-backed wind power credits. Baxter Brewing varieties are distributed in Maine by Nappi Distributors and Pine State Distributors; and in Massachusetts by the affiliates of the Massachusetts Beverage Alliance.